In this May 9, 2017 photo, Interior Secretary Ryan Zinke rides a horse in the new Bears Ears National Monument near Blanding, Utah. Much of Bears Ears is on land administered by the Bureau of Land Management, which is part of Zinke's department. Western lawmakers are arguing that BLM headquarters should be moved from Washington, D.C., to the West because of its influence there. U.S. 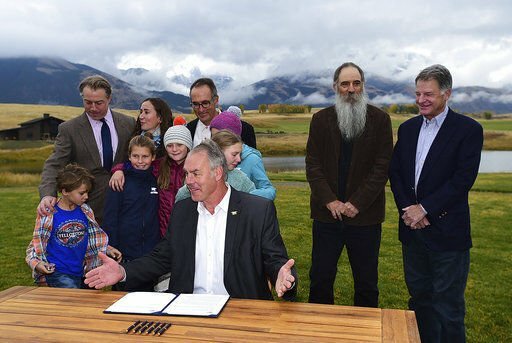 Interior Secretary Ryan Zinke, center, is surrounded by residents, business people and family members as he signs a 20-year mining moratorium on lands in Paradise Valley, Mont. on Oct. 8, 2018 at Sage Resort in Pray, Mont. U.S. Interior Secretary Ryan Zinke speaks during a conservation announcement at the Western Conservation and Hunting Expo Feb. 9, 2018, in Salt Lake City. Interior Secretary Ryan Zinke speaks to members of the media outside the White House in Washington on Aug. 16. U.S. Gold Corp.'s office on 11th Street in Elko, as seen Tuesday. “We’re excited to have Secretary Zinke help move us forward” on two pending mining projects, in Nevada and Wyoming, Edward Karr, head of U.S. Gold Corp., said by phone. The Nevada project, known as Keystone, is on bureau land in Eureka County’s Cortez Trend. After the announcement Tuesday, the company’s vice president said Zinke will be able to offer a lot as a board member. Mathewson commented that Zinke might be able to help as they go through the permitting process on their Wyoming project, which is entirely on Wyoming state land. Karr initiated the contact with Zinke, Mathewson said, and about a month ago Zinke and Mathewson spent about 45 minutes visiting on the phone. “I guess he liked what he saw,” Mathewson said. “I think he’s very interested in the business of mining and the exploration associated with mining. U.S. Gold Corp. announced Zinke’s board appointment in a press release with an Elko dateline. The “commander” title refers to Zinke’s 23-year career in Special Operations in places such as Iraq, Bosnia and Kosovo. “He was awarded the Bronze Star for combat in Iraq and is credited with conducting 360 combat missions and the capture or kill of 72 terrorists,” state the press release. U.S. Gold focuses on exploration and is one of the junior companies in the mining world. It’s Keystone project is 20 square miles and is almost entirely on Bureau of Land Management land. The Environmental Assessment for the Keystone property was completed in September 2018. Mathewson said it took about 19 months to complete, which cost the company almost two entire field seasons. He said the major companies are better able to handle permitting delays, because they have many projects going at once. However, Mathewson said, nowadays the juniors are often the ones dealing with the delays and expense of a long permitting process. Elko Daily Free Press mining editor Tim Burmeister contributed to this report. Elko-based U.S. Gold Corp. hopes to begin exploration drilling this year at its Keystone exploration site in Eureka County and possibly at its Copper King site near Cheyenne, Wyoming. Yup, draining the swamp alright.